Conservation groups are calling on the federal environment minister, Greg Hunt, to contribute funds from the Federal Government’s $2.55 billion carbon emissions reduction fund to protecting the Great Koala National Park. This comes after revelations (The Age 21.1.15) that federal environment minister, Greg Hunt, commissioned a report which found that ending logging in the highland forests north-east of Melbourne, would save about 3.2 million tonnes of carbon dioxide emissions a year which could reap Victoria $30 million a year and achieve 5 per cent of the emissions cuts needed to meet Australia’s carbon reduction target for 2020. North East Forest Alliance spokesperson Dailan Pugh said that “Koalas prefer larger trees for feeding, these are trees that have been taking up and storing carbon in their wood for decades or centuries. “If allowed to remain these trees will continue to provide food for the Koalas while taking up increasing amounts of carbon the older they get. Protecting these trees is not just good for Koalas, it is part of the solution to climate change and of direct benefit to all of us. “We have just had the warmest year on record and the increased temperatures are already having profound affects on our forests, our wildlife and us. For all our benefits urgent action is required to curtail our emissions by increasing the carbon take-up and carbon storage in our forests. 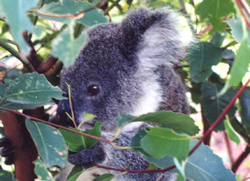 We can do this just by stopping logging and protecting Koalas,” Mr Pugh said. NCEC Vice-President Susie Russell said “NSW taxpayers are currently paying $8-15 million a year to subsidise logging of public forests, in return for this the logging is threatening the future of numerous species, causing erosion, silting up our rivers, decreasing stream flows, spreading weeds and causing dieback of our publicly owned forests. “We can turn this massive loss into a profit simply by stopping logging. If the Federal Government invests in avoiding emissions from logging, taxpayers stand to make a fortune just from protecting Koalas, and we can invest some of this into providing meaningful jobs in restoring degraded forests and increasing their carbon take-up and storage. “This can be a win-win for the community and Koalas, while helping to redress our burgeoning carbon emissions. “We call on Minister Hunt to urgently investigate the carbon benefits of protecting the Great Koala National Park and identify what the Federal Government would be prepared to pay to avoid the carbon emissions from continued logging”, Ms Russell said. The NSW Government’s long-awaited response into the Public Land Inquiry has finally ruled out logging in northern NSW National Parks in order to make up timber shortfalls. “This is a decision for common sense and we are pleased that Premier O’Farrell has decided to quell the speculation,” said NCEC President Susie Russell. “There is little doubt that the Government has seen the support and love that National Parks enjoy from a wide spectrum of the community. There has been overwhelming opposition to his decision to allow hunting in National Parks. Logging was clearly a bridge too far. “We know that there were some inside the Government who actively promoted the Inquiry’s recommendation for ‘tenure swap’ : swapping logged State Forest for unlogged National Park; as a means of shoring up the logging industry. By clearly rejecting that proposal the Premier has taken action to rein in some of the more anti-environment forces that inhabit the Government benches,” Ms Russell said. North East Forest Alliance spokesperson, Dailan Pugh said that now that the timber industry’s proposal to open up a million hectares of north-east NSW’s national parks for logging has been rejected, the NSW Government must urgently slash timber commitments from State forests down to a sustainable level. “The timber industry has been intentionally logging north east NSW’s public forests well in excess of the identified sustainable yield for the past 15 years. They have been cutting out the future of their own industry. “If the NSW Government wants a hardwood sawlog industry in north east NSW in 10 years time it must immediately reduce logging quotas down to a sustainable level. We expect this will require cuts of more than 50%. The longer the Government waits the deeper the cuts will have to be. “The Government must come clean with the public by releasing last year’s timber review and acting urgently to stop the gross over-logging of publicly owned lands” Mr. Pugh said. A national report on Australian forestry “One Stop Chop: How Regional Forest Agreements streamline evironmental destruction”, released today, makes it clear that State Government forestry agencies, including in NSW are not managing Australia’s forests for the long-term. The report, was prepared by Environment Defenders Offices in Tasmania, Victoria and NSW, and edited by Lawyers for Forest. “The current regulatory system for management of NSW’s public forests is clearly inadequate” said NCEC President Susie Russell. “Cumulative impacts are killing the possibility of much of our unique wildlife surviving into the next century. The regulations are no protection because they aren’t followed anyway. There is little auditing and virtually no monitoring of impacts. “The Mining and Coal Seam Gas industry is running an advertising blitz calling for environmental decision-making, assessment and regulation to be taken away from the Commonwealth and handed back to State Governments. The Regional Forest Agreements are and example of all the problems with that approach. “In the 21st century with our rivers, oceans and forests all suffering from over-extraction and pollution, and our iconic plants and wildlife under increasing threat, it is not the time to minimise environmental oversight. This Report sounds a warning and if we don’t heed the message we will repeat all the mistakes,” Ms Russell said. NEFA spokesperson Dailan Pugh said the Commonwealth has used the Regional Forest Agreement as its excuse for doing nothing, as the NSW Government has removed and ignored protections for federally threatened species. “The Commonwealth did nothing when the area required to be protected around records of the nationally endangered Hasting River Mouse was slashed from a maximum of 200ha down to 12ha, despite this being in contravention of the federally adopted Hastings River Mouse Recovery Plan. “The RFA has been the Commonwealth’s excuse for refusing to improve logging prescriptions for the nationally vulnerable Koala, or to do anything when existing requirements are routinely ignored. “The Regional Forest Agreement should not be an acceptable excuse for the Commonwealth to ignore its obligations to protect nationally threatened species”, Mr. Pugh said. North Coast conservationists are fearful that a NSW Government proposal to allow burning of wood from native forests for electricity generation will result in extensive degradation of north-east NSWs public and private forests if successful. Spokesperson for NEFA, Dailan Pugh, said that it was only last month that the export of woodchips from north-east NSW finally ended after 30 years. “Now the NSW Government wants to burn our forests to generate electricity. “With the prospect of furnaces being established throughout north-east NSW and the Hunter Valley this could lead to the unprecedented degradation of native forests”. “Our native forests are most important as homes for native plants and animals, for provision of stream flows, as storehouses of carbon and for passive recreation. “Our forests sequester significant volumes of atmospheric carbon and store it in their wood. They are worth far more left standing as carbon storehouses to generate carbon credits than they are for logging and release of their stored carbon. Burning our carbon storehouses for electricity is one of the worst things we can do for global warming. “The NSW Government should use the opportunity provided by the cessation of woodchipping to stop the ongoing degradation of our native forests by limiting logging to speciality purpose high value products” Mr. Pugh said. Susie Russell, President of the North Coast Environment Council said there were no positives in the move to allow forests to be logged to feed in to power stations for electricity. “Sawmill waste can already be used as a fuel, what is being proposed here is that trees that were being exported as woodchip (pulp) should now be burnt” she said. “The end to export woodchipping provided the NSW Government with an opportunity to decrease logging quotas and the intensity of logging that is trashing the State Forests. Instead, they have chosen to opt for an even more destructive industry that won’t pass the sustainability test of time. The future demands innovation and clean forms of energy. This move belongs to the past,” she said. “The proposal will be on exhibition for 28 days, we urge the community to take this opportunity to say NO!” Ms Russell said. Conservation groups have written to the NSW Minister for the Environment and Minister for Primary Industries asking them to take urgent action to stop illegal logging of Rufous Scub-bird habitat in Styx River State Forest, east of Armidale, and instigate an independent inquiry. The Rufous Scrub-bird is a small secretive understorey bird of highland wet forests in north-east NSW. It is a living fossil with a lineage dating back 97 to 65 million years but is now listed as vulnerable to extinction, with burning and logging recognised as primary threats. North East Forest Alliance Spokesperson Dailan Pugh said that in 2007 a Forests NSW ecologist saw Rufous Scrub-birds at 7 locations in compartment 502 of Styx River State Forest. “Forests NSW identified these records as extremely reliable and they were included in NSW’s Wildlife Atlas. “Forests NSW’s Threatened Species Licence requires that all suitable habitat within 320 metres of such records must be protected from logging and management burns. “When a local conservationist inspected the area in March he was shocked to find that Forests NSW had burnt the bird’s habitat and were in the process of logging it. When he checked their logging plans he found that all the records of the Rufous Scrub-birds had been deleted” Mr. Pugh said. North Coast Environment Council President Susie Russell said she had met with the regional forester about the issue. “I was told that when planning the current logging Forests NSW questioned their ecologist about his records and decided that he had erroneously identified a common bird for the Rufous Scrub-bird. “In an astounding move, apparently without undertaking new surveys, Forests NSW then attempted to delete all records made by their ecologist and proceeded to ignore both the records of the Rufous Scrub-bird and the mapped habitat in their planning process. “We know that Forests NSW are desperate for timber and it seems they are prepared to go to any length, including breaching their licence conditions, to obtain it” Ms Russell said. Clarence Environment Centre spokesperson, John Edwards, said that in response to Forests NSW’s claims that no suitable habitat existed in the area, he organised a visit to the area by two experienced ornithologists. “Contrary to Forests NSW’s claims, both experts agreed that there are extensive areas of ideal habitat for the Rufous Scrub-bird and that it appeared that logging areas would have been good habitat prior to being trashed. “Conservationists are dismayed that despite it being over a month since blatantly illegal logging of the habitat of a threatened species was reported to the new Environmental Protection Authority they have failed to undertake a proper investigation and refused to stop the logging. “We have therefore appealed to the responsible Government Ministers to immediately stop the logging while an independent inquiry into this sordid affair is undertaken” Mr. Edwards said. Timber Supply Crisis to cost taxpayers millions for non-existent timber. Court documents obtained by the NCEC confirm that Forests NSW are unable to meet timber commitments and are having to pay out mills for timber that never existed. NCEC President, Susie Russell, said that ever since the NSW Government gave new Wood Supply Agreements for timber from public land to millers in 2004, Forests NSW have not been able to supply the committed volumes. “At the time the new Wood Supply Agreements were issued there was abundant evidence that Forests NSW’s resource estimates were grossly overstated and unreliable. Unfortunately at that time the NSW Government removed a clause that was in previous agreements that allowed timber commitments to be reduced in line with yield reviews. “Timber giant Boral initiated proceedings in the Supreme Court against Forests NSW in 2010 claiming Forests NSW have been unable to supply them with contracted timber volumes since 2002. The court documents show that Forests NSW were forced to pay Boral half a million dollars in 2006 for undersupply to that time. Since then supply has been declining and Forests NSW now owe Boral almost twice as much again,” she said. “In vain efforts to meet shortfalls Forests NSW have been over-logging plantations, cutting trees before they mature, increasing logging intensities, logging stream buffers, logging trees and areas required to be retained for threatened species and buying timber from private properties. “Despite leaving the forest looking like a battlefield and cutting out the future sawlogs, Forests NSW still cannot get them enough wood,” said long-time forest activist with the North East Forest Alliance, Dailan Pugh, who as a result of analysing all FNSW timber yield estimates predicted the timber supply crisis in 1999. “The NSW Government’s recklessness in issuing the new Wood Supply Agreements in 2004 has already cost taxpayers a fortune, and exposed us to many millions of dollars in future compensation. The environmental costs are astronomical,” he said. “The crisis is real and ongoing. The gross over-cutting now happening must be stopped immediately. Timber quotas must be immediately reduced to a sustainable level. The legal dispute between the Government and Boral is perhaps the only opportunity this Government will have to make these changes. Failure to do so could lead to further massive compensation payouts as well as doing irreparable damage to our public forests,” Ms Russell said. North coast environment groups have described the extent of coal seam gas exploration licences in NSW as a disaster waiting to happen, and in a submission to the Coal and Gas Strategy have called for an immediate moratorium on any further coal seam gas approvals in NSW. Submissions closed last Friday on the NSW Coal and Gas Strategy, which was released by the former Labor Government for public exhibition, but which the new Coalition Government has indicated it will probably go on to adopt. “Just last week, as we finalised our submission to the NSW Coal and Gas Strategy Scoping Paper, we uncovered the full extent of coal seam gas licences across NSW” said Ms Carmel Flint, spokesperson for the North East Forest Alliance. “Using Department of Mineral Resources data, we found that 23.5 million hectares of NSW is already covered by petroleum exploration or production licences, and a further 13.8 million hectares has current applications pending approval. This equates to almost half of NSW. “Almost the entire north coast, from Gosford in the south to Byron Bay in the north, is covered by existing exploration licences or applications. “These licences have been issued across vast swathes of NSW without any community consultation whatsoever and without any meaningful environmental assessment. “Evidence from Queensland and overseas indicates that coal seam gas production has lasting and irreversible impacts on water resources, rural communities and native wildlife. “The former Labor Government had been busy handing out approvals like lollies, without any fair system of checks and balances or any opportunities for the community to have its say” said Ms Susie Russell, vice-president of the North Coast Environment Council. “Now, the spread of the industry across NSW is looming as a cause of massive land-use disputes, which we predict will lead to unprecedented conflict in rural NSW over the next decade. “Action is needed now – we are asking the Premier, Barry O’Farrell, to implement an urgent moratorium on coal seam gas exploration and production in NSW. “There also needs to be far-reaching planning reforms that prevent exploration in high conservation value areas, protect water resources and give the community a real say and active participation in making decisions.